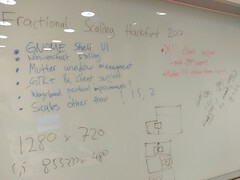 The fractional scaling era for GNOME shell has finally arrived! The news spread out quite quickly, once last Friday Jonas pressed the button and that triggered the last-second merge for the relevant proposals we prepared for Mutter and GNOME Shell in order to get this available for GNOME 3.32. As someone might recall, we started this work some years ago (ouch!) 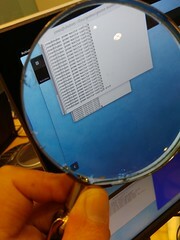 and lead to an Hackfest in Taipei, but in between other work to do and priorities which caused this to be delayed a bit. While the first iteration was ready for some time now. But at every review we improved things fixing bugs (like missing scaled widgets) and optimizing some code paths, so hopefully this time helped in serving better quality :). We’ve still quite a lot of work to do (see these issues for mutter and shell) and some fixes that we have in queue already, but the main task is there. So starting from now the shell will paint all its elements properly and in good visual quality at any fractional scaled value, and independently for every monitor. As you might have noticed in the screenshot above, the X11 apps are still not really scaled in quality, while it’s not possible for them all (like xterm there), we need to work for a solution that will cover the legacy applications which does support scaling, and at the same time those which doesn’t want to be scaled at all (games!). gsettings set org.gnome.mutter experimental-features "['scale-monitor-framebuffer']"
Doing this will allow you to set more a wider set of scaling values under Control Center, display panel. For what concerns Extensions, most of them should work with no change, but not those using directly the St.TextureCache, as we changed the methods signature by adding a resource_scale parameter. We discussed weather adding another method instead (as gir doesn’t support default values), but since 3.32 will need anyway a rewrite of most extensions anyways, and since it’s better to have them to behave properly with resource scale since the beginning (instead of blurred contents), we decided not to do it. So, please sync with this change (and sorry :)). Putting my Ubuntu hat now, this won’t change much things for default ubuntu experience, since it’s still using X11 (although I’ve something in the works for this too), but people who want to take advantage of this can easily just login using the Ubuntu on Wayland session, enable the experimental setting and profit. As final world, thanks to people who helped having this in by reviewing and testing the code. 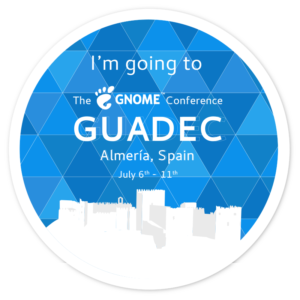 I’m going to GUADEC (with Ubuntu Desktop team)! I’m writing these lines while I’m in the flight to Almeria where this year’s GNOME Users And Developers European Conference will take place, typing with my Thinkpad Bluetooth keyboard on my mobile phone (I’ve to admit that the Android physical keyboard usage is getting awesome, allowing proper WM actions) :), as the battery of my T460p was already over after the flight from Florence to Madrid during which I fixed some more shell JS errors. 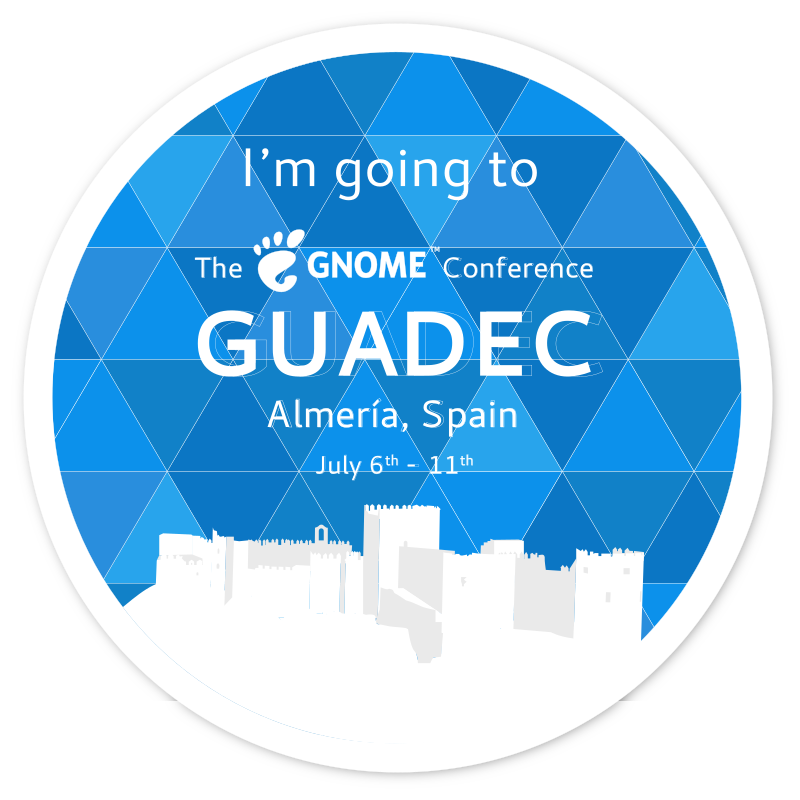 This will be my first GUADEC ever, and as a fresh Foundation member, I’m quite excited to finally join it. 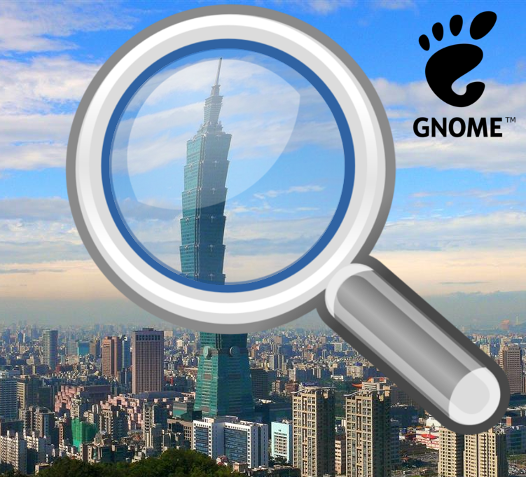 I’m not coming alone, of course, as this year the ubuntu-desktop team will be quite crowded, as me, Ken VanDine, Sébastien Bacher, Didier Roche, Iain Lane, James Henstridge and Robert Ancell will be part of the conference, to give input and help to get GNOME even better. Soo, looking forward to meet you all very soon (almost landed – or better – trying to, in the mean time)! As always, I’ve to thank Canonical for allowing me and the desktop crew to be part of this great community reunion. But also for being one of the silver sponsors of the event. These are the events that really matter in order to get things done. Hey guys, although I’ve been around for a while hidden in the patches, some months ago (already!?!) I did my application to join the GNOME Foundation, and few days after – thanks to some anonymous votes – I got approved :), and thus I’m officially part of the family! 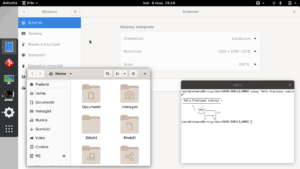 Ubuntu goes GNOME, theming stays. Let’s test (and tune) it! Hi guys! Again… Long time, no see you :-). 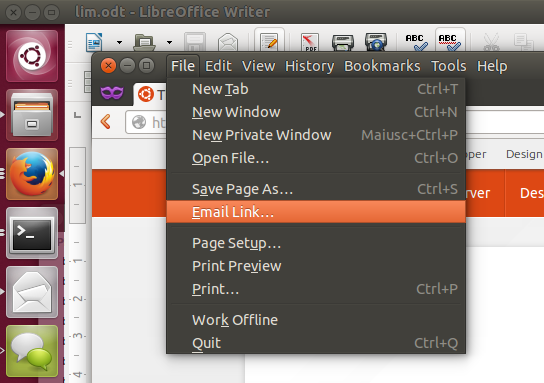 As you surely know, in the past weeks Ubuntu took the hard decision of stopping the development of Unity desktop environment, focusing again in shipping GNOME as default DE, and joining the upstream efforts. While, in a personal note, after more than 6 years of involvement in the Unity development, this is a little heartbreaking, I also think that given the situation this is the right decision, and I’m quite excited to be able to work even closer to the whole opensource community! One important aspect of this, is the visual appearance, and the Ubuntu Desktop team has decided that the default themes for Ubuntu 17.10 will continue to be the ones you always loved! 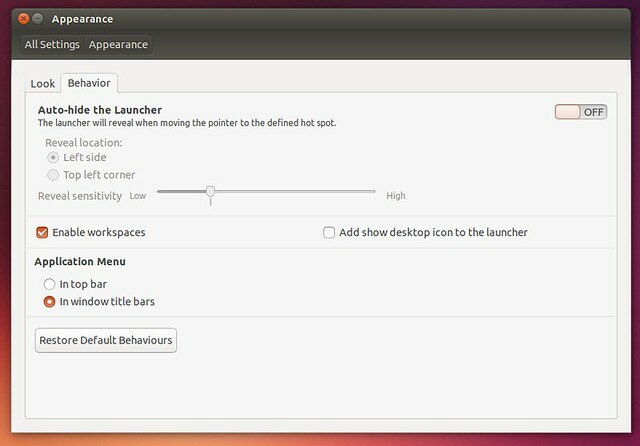 Right now some work is being done to make sure Ambiance and Radiance look and work good in GNOME Shell. In the past days I’ve released a new version of ‘light-themes‘ to fix several theming problems in GNOME Shell. 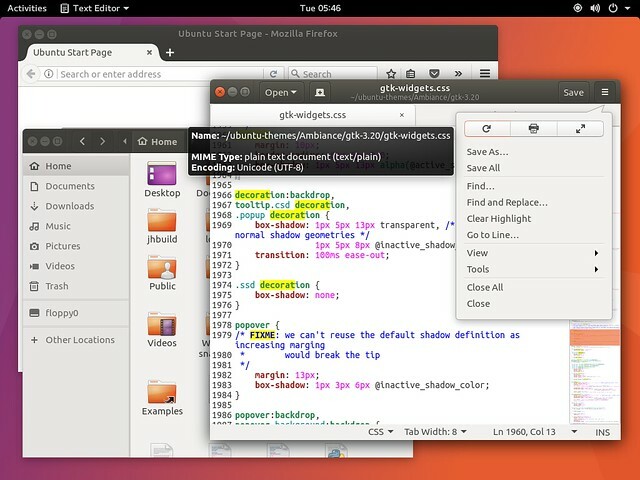 This is already quite an improvement, but we can’t fix bugs we don’t know about… So this is where you can help make Ubuntu better! Salve gente! Oh, no ora si parla “inglese” via…. This is the first blog post here after soooo many years… Something like almost 7 years, really?!? Oh, yes… You all thought that I was dead as a blogger I guess, and well mostly I am as my time for writing really went below 0 during this time, and then… Well as always I wanted to keep this thing updated following “my rules” of keeping the timeline in sync with actual events, but this failed everytime… And so, yeah here we are after so much time! The main reason why I become unresponsive during these years was that instead of writing text, I moved to write code (for real) and I found it much more fun and useful for the people around me. More importantly during this period my commitment with the Free Software increased and I joined or submitted patches to various projects such as Compiz, Openmoko, EFL (Enlightment Foundation Libraries), GNOME, and… Well how you might think from the pic, Ubuntu. Ubuntu took a very important role in my life since about the last months of 2010, when Unity, was proposed as the new default desktop environment, I liked a lot the idea, but it was still a new baby with many missing features and bugs and so I decided to jump on the boat to give my help to make Unity the best desktop. And well, long story short, I’m now working at Canonical for more than 2 years as a Software Engineer for the Unity Shell! 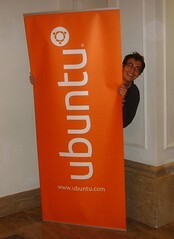 I love this job and I think we’re doing great things, trying to make the Ubuntu vision happen in every form factor. 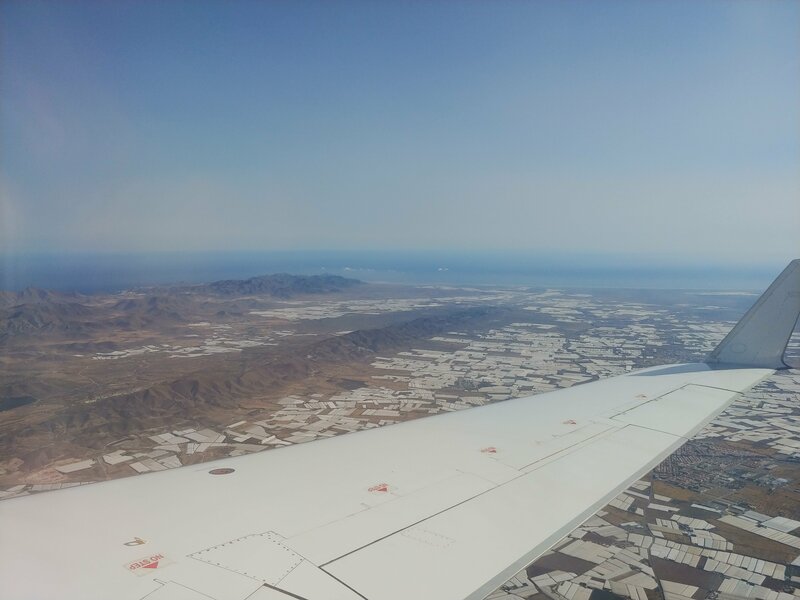 You might be able to read more about this experience on my Google+ page or looking at my opensource contributions at ohloh. 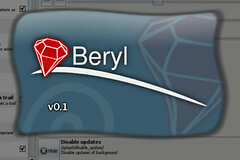 Beryl 0.1 out! È uscito il nuovo “gioiellino”! A pochi giorni dalla notizia della divisione di Compiz in un branch “ufficiale” (figlio dello splendido lavoro di David Reveman presso Novell) e nel suo fork Beryl (letteralmente, pietra preziosa) e dopo alcuni giorni di attesa in cui si sono susseguiti dissensi ed assensi (come nel mio caso) di vario genere, siamo finalmente pronti a vedere in una prima release di testing di questo «nuovo» Composite Manager figlio della comunità! È vero che era già possibile testare Beryl compilandoci il tutto dai sorgenti presenti nell’svn, ma questa si tratta della prima redistribuzione in pacchetti (per “noi” .deb) di beryl! Una comodità non da poco, sempre dovuta sopratutto al mitico QuinnStorm. Notate che questa pre-release è nata soprattutto con lo scopo di testing e bug-fixing, quindi per eventuali problemi vi prego di consultare il forum di Beryl e magari di riportare dei nuovi ticket nel Bug Trac (in entrambi i casi non serve neanche la regisrazione!). Dalle mie prime prove, mi pare però una suite già abbastanza solida! Sono stati aggiunti nuovi plugin quali blurfx (al posto di blur e reflections) e splash (mostra uno splash all’avvio di Beryl). Aggiunte nuove funzionalità a plug-in esistenti quali animation, move, bench e blurfx. Risolti molti memory leak, con conseguente migioramento di prestazioni. Per le altre distribuzioni, controllate questo wiki! Il nuovo beryl è configurato inizialmente in modo piuttosto sobrio a differenza dello “sborone” compiz, potrete comunque usare il beryl-settings per reimpostarvelo a piacimento. Quindi, riavviate beryl facendo tasto destro sul "diamantino" rosso nella vostra traybar e quindi su "Ricarica Gestore di Finestre". Dovrebbe funzionare alla perfezione, iniziate quindi a divertirvi con beryl-settings, qualora però questo piccolo tip non funzionasse potete ripristinare il file ~/.beryl/settings.bak (o cancellate direttamente ~/.beryl/settings.bak). Eh, beh… Ieri sera un ragazzo americano (USA) con nick Kroneage ci ha stupito tutti con un primo video con le XGL “ballerine”! Ha tenuto a sottolinare che l’ha fatto senza "finezze", ma come primo risultato non è per niente male… Che altro dire, se non lasciarvi al filmato?!?! Divertitevi! PS: La musica usata nel video è solo strumentale prodotta da un gruppo europeo chiamato Machinae Supremacy e presa dal gioco Last Ninja per C64; Il tutto è stato realizzato con un PC di quasi 4 anni fa che monta un P4 a 2.4GHz con 512Mb di RAM e scheda video Nvidia 6600 GT con qualche leggera modifica più recente. Qui, trovate il post originale. If you’ve loved this video, please Digg it ! Se ti è piaciuto questo video, per favore, Digg it !